India, an International Human Rights Program (IHRP) clinic student, travelled to Rwanda this past November to interview the survivors featured in The Men Who Killed Me: Rwandan Survivors of Sexual Violence with the rest of the project team. The purpose of the trip was to generate testimonials for a second edition of the book. These are her reflections on the trip. "Women are the primary resource of our planet. If they are destroyed, with them so is our future. If they are violated and desecrated anywhere on this earth, we are all violated and desecrated.” -- Eve Ensler, December 11, 2008, Afterword to The Men Who Killed Me. The first thing I noticed about Rwanda was the birds. On our first morning in Kigali, as I sat on the veranda of our guesthouse, I was overwhelmed by the chorale of unique voices: some bleated, some chirped and twittered, and others hummed. Every inch of air was teeming with life. Later that day, the IHRP team—Samer Muscati, Yolanda Song and I—visited the Kigali Genocide Memorial. At the end of the exhibit, we watched a short video featuring testimonials of genocide survivors, and I found one woman’s testimony particularly striking. She said that when she returned to Kigali after the genocide, everything was silent—even the birds. Having witnessed the symphony of birds that same morning, I wondered, how could there ever have been a time when all the birds were silent? This was the first of many similar moments over the course of our ten-day trip. I struggled to reconcile what I had heard and read about Rwanda and the genocide with what I saw and experienced. I was constantly being pulled between 1994 and 2018, between suffering and joy, and between horror and awe. The IHRP team travelled to the south of Rwanda to visit Marie Mukabatsinda, one of the survivors featured in The Men Who Killed Me and And I Live On, at her home in Rusatira. 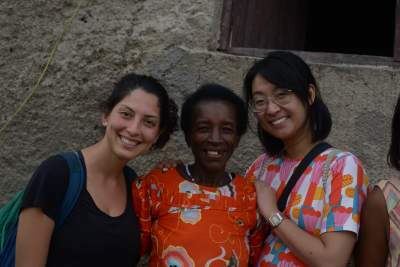 From left: India Annamanthadoo (IHRP clinic student), Marie Mukabatsinda, and Yolanda Song (IHRP Research Associate). Credit: Samer Muscati. Rwanda’s physical beauty was another aspect that stirred up in me a sense of unanticipated astonishment. During my months of preparatory research, I had subconsciously envisioned Rwanda to be as ugly as the atrocities committed on its soil in 1994. But Rwanda is, without a doubt, one of the most beautiful places I have visited. The landscape is dominated by rolling green mountains, which contrasts the rust-coloured soil. In the countryside, soil-stained homes with brightly-painted doors are surrounded by crops of banana, cassava, pineapple and peanuts. I felt like I was walking through a watercolour painting. And yet, I found it difficult to reconcile this beauty with the horrific crimes that had been committed on these very grounds. What did this very landscape look like during the genocide? Was someone murdered or raped right where I was standing? Did the vibrant red soil mask the blood of the victims? Was I stepping on someone’s final resting place? I am fortunate that I will never know the answers to these questions. Perhaps the closest I came to understanding the texture of those one hundred days in 1994 was during our visit to the Nyamata Genocide Memorial. Unlike the museum-esque Kigali Genocide Memorial, the Nyamata Memorial is a preserved site of killing. On the way there, Samer, who had visited Nyamata on a previous trip to Rwanda, tried to warn me that this site was “difficult”; but nothing could have prepared me for Nyamata. As our car pulled up to the site, I was unsure whether we were in the right place. I could have easily driven past the ordinary building without a thought—it was a one-story brick structure surrounded by a well-kept garden. In an effort to preserve the site, there are no plaques or descriptions explaining the significance of these grounds; instead, this responsibility is left up to the guide, who had left his post for the day. Without a guide, I was left to experience Nyamata at a purely sensory level. As I walked into the building, my eyes adjusted from the bright sun to the dimly lit interior, and I slowly realized that this had been a church. Beneath a ceramic Virgin Mary statue on the far wall, rows of pews were arranged around an altar table. Each pew was piled with heaps of blood-stained clothes belonging to the victims who had died in the church. A machete and some other weapons rested on the altar table, which was also stained with blood. A metallic smell lingered in the air. A glass case of damaged skulls sat in the middle of the church. Looking up, I noticed that the sun was shining through little holes in the sheet metal roof—the effect was beautiful, almost like stars in the night sky. Samer told me that the holes were the result of bullet holes and grenade shrapnel. I felt a jolt—that recurring sense of guilt for appreciating beauty in a place that endured atrocity. We walked around to the back of the church, and found ourselves in a mass grave, which contained rows and rows of caskets filled with bones. I later learned that an estimated 5,000 people were massacred in the Nyamata Catholic Church over a two-day period. At the beginning of the genocide, Tutsi residents from the area had gathered in the church, believing they would be protected from the Hutu militia. Instead, the large number of Tutsi people gathered in one place allowed the perpetrators to massacre thousands of victims at once. The perpetrators threw grenades into the church and brutally murdered the remaining survivors with guns and machetes. My experience at Nyamata deepened my awe of the survivors’ resilience. I felt sick even imagining these crimes, but many of the survivors we worked with had witnessed similar scenes with their own eyes. They had watched the massacre of their friends and families, and they themselves had been victims of unspeakable crimes. These scenes live on 25 years following the genocide, in survivors’ memories and nightmares. And yet, meeting these survivors, I still saw great joy and love within them. Despite all they had experienced, they smiled, laughed, hugged, and danced. Yes, sometimes we cried with them in our interviews, but we also shared many beautiful, happy moments together. For most of the survivors we interviewed, access to services—including counselling, HIV treatment and microcredit programs—is central to their ability to endure in the face of trauma. The survivors also derive healing from one another. After having lost many relatives in the genocide, they have found family and a sense of belonging in each other. Reflecting on these 10 days in Rwanda, I have gradually made peace with my own conflicting feelings about this beautiful country and its history. The survivors taught me that resilience is not about ignoring difficult realities—rather, it is about honouring both the beauty and pain that coexist inside of you. This is, of course, a feat of much courage and strength. But as we approach the twenty-fifth commemoration of the genocide, Rwanda and the survivors of the genocide prove that it can be done. Murakoze cyane to my friends in Rwanda!